TREIRB DL Degree Lecturers Results with Marks 2019 Released at treirb.telangana.gov.in: TREIRB DL Degree Lecturer Posts Hall tickets 2018, TREIRB DL Degree Lecturer Posts Exam Date 2018, TREIRB DL Degree Lecturers Recruitment Hall tickets 2018, TREIRB DL Degree Lecturers Recruitment Exam date 2018, Important Instructions to Degree Lecturers Candidates, Telangana Residential Recruitment Degree Lecturers Hall tickets, Telangana Residential Recruitment Degree Lecturers Exam Dates. TREIRB DL Degree Lecturer Posts 2018 Hall tickets, Exam date at treirb.telangana.gov.in. 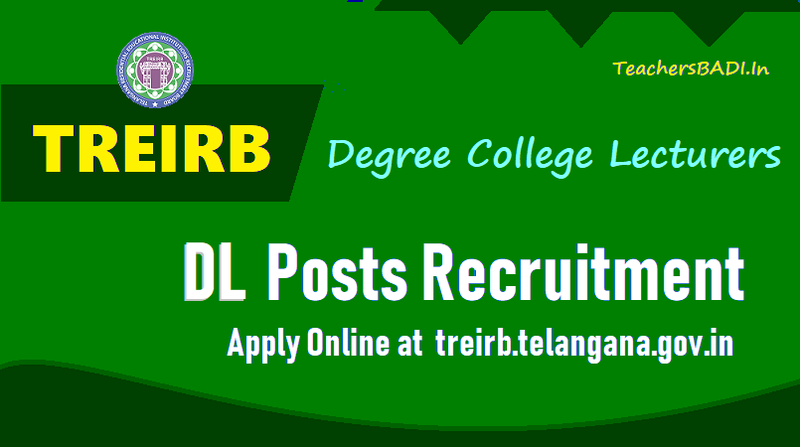 TREIRB RDC DL Degree Lecturer Posts 2018 Recruitment, Apply online at https://treirb.telangana.gov.in: TREIRB to be fill DL Degree College Lecturer Posts in Residential Educational Institutions Societies through Direct Recruitment 2018. Telangana Residential Recruitment Board has given the DL Degree Lecturer Posts 2018 recruitment notification to fill the Degree Lecturer DL Posts in #TREIS, TSWREIS, TTWREIS, MJP TBCWREIS and TMREIS Residential Instituitions through Direct Recruitment. TREIRB DL Degree Lecturers Results with Marks 2019 Released at treirb.telangana.gov.in: TREIRB has released the DL Posts Recruitment Exam Results with Marks and Final Answer keys on March 16, 2019. Results would be enabled on March 19, 2019. The candidates who have appeared for the Degree Lecturer Posts Recruitment examination can download their Results with Marks by log in to the website. The TREIRB is conducting this examination to recruit Degree Lecturer (DL) posts across the state. The recruitment will be done on the basis of the written test results and interview rounds. TREIRB DL Degree Lecturers Written Exam Schedule (DL Exam dates) 2019 released for General Recruitment for 466 Posts of Degree Lecturers (DL) in Telangana Residential Educational Institutions Societies. The following is the schedule for the JL and DL written examination. TREIRB DL Dgree Lecturer Posts 2018 Hall tickets: Hall tickets would be enabled one week before the examination. The candidates who have registered for the Dgree Lecturer Pposts Recruitment examination can download the hall ticket by log in to the website. The TREIRB is conducting this examination to recruit Degree Lecturer (DL) posts across the state. The recruitment will be done on the basis of the written test results and interview rounds. How to download the DL hall ticket 2018? TREIRB DL Degree Lecturer Posts Recruitment notification to be released for fill up the below mentioned posts in TS Residential Institutions through Direct Recruitment - Telangana Gurukulam Recruitment Board DL Degree Lecturer Posts in TREIS Instituitions. Applications to be invited Online from qualified candidates through the proforma application to be made available on Board’s TREI-RB WEBSITE (www.treirb.telangana.gov.in) to the post of Degree Lecturers in Residential Educational Institutions Societies. So, Telangana Residential Educational Institutions Recruitment Board (TREI-RB), Hyderabad would invite applications for the post of Degree Lecturers in Residential Educational Institutions Societies. i) Good academic record in Post Graduation in the relevant subject (as shown in Annexure-A) with A minimum of 55% marks of an equivalent Grade of B in the 7 point scale with letter Grades O,A,B,C,D,E and F obtained from the Universities recognized in India. TREIRB Telangana Recruitment 2018: Apply for degree college lecturer posts: The online application process for approximately 467 posts of degree college lecturers in Telangana Residential Educational Institutions societies began on August 14. Candidates can register by visiting the official website of Telangana Residential Educational Institutions Recruitment Board (TREIRB) at treirb.telangana.gov.in. The last date to submit the application is September 13, 2018. The examination schedule will be displayed later on the website. The hall ticket can be downloaded from the official website seven days before the commencement of exam. ii. Last date for submission of ONLINE applications Dt: 20.09.2018.